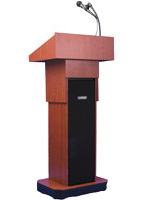 This adjustable column wireless sound lectern offers elegant looks, sturdy construction and high tech integration. 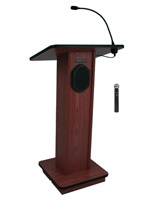 Designed for use in auditoriums, lecture halls, at conventions and conferences or in board, meeting and training rooms, the mahogany finish reading stand adjusts easily between 39" and 45" in height. 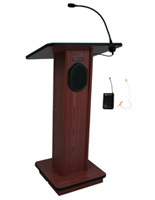 The height adjusting column wireless sound lectern features 50W built-in speakers and comes with a handheld microphone for maximum audibility. 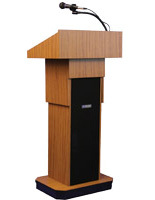 Each presentation fixture stands on four hidden casters (2 locking) for easy movement. 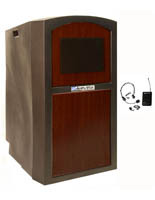 The mahogany finish portable wireless sound lectern has a 24" wide reading shelf with book stop. 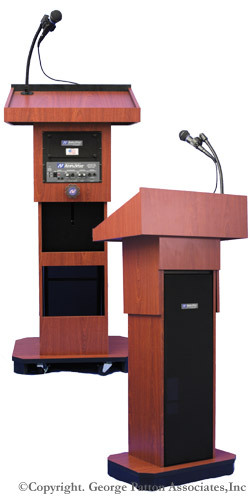 The height adjusting reading stand's amplification system allows use of both the wired dynamic and handheld microphone at the same time.